Eqbal was always impressed with the high level of support offered by all academic staff, and the personal support she received ensured her success at LSBU. 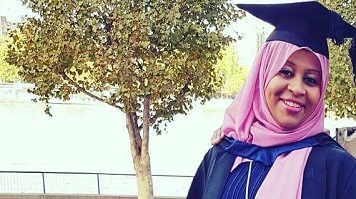 Having studied at LSBU in 2009 it was an easy decision for Eqbal when she decided to return to an institution that she was happy with, provided everything she was looking for, and helped develop her career further. It was a passion for her job that led her back to further studies, and the learning environment and enthusiasm of the academic staff helped Eqbal continue her learning journey. Eqbal had a strong desire to continue her learning for the benefit of her patients, but striking the right balance was something she had to consider. “I did and still do work in the NHS, managing teams in the delivering the Health Visiting Service in a Central London NHS Foundation Trust. When I initially thought about returning to studying, I weighed up all the pros and cons, and decided that it would ultimately benefit the patients, my future development, and improve my confidence in the workplace. "This degree has helped me apply in-depth knowledge to my every day work and practice. I bring skills from my degree to my role, supporting teams deliver a good public health service and achieve good health outcomes for our local community and population". Eqbal had the opportunity to undertake a mentorship programme while on the course with the Public Health Department in Lambeth, in partnership with LSBU. Eqbal considers this the highlight of the course, as it enabled her to develop employability skills, and contextualise her learning. “During this placement I was very much able to transfer knowledge acquired from different modules such as epidemiology, policy analysis and research into real contexts and practices, under supervision from a Public Health Consultant”. Whilst Eqbal already worked in the NHS, this course and its learning outcomes have allowed her to develop within her role and allowed her to provide support to the team in which she works. Furthermore, it enables Eqbal to develop a public health service and positive outcomes for the local community and population. Eqbal now works alongside senior teams and local authorities to map out programmes and services that are commissioned to meet the needs of the local community. Eqbal was impressed with so much about her time at LSBU, particularly how helpful the academics were. “Lectures were delivered by highly experienced academics who are experts in their field. Not only was I able to learn from them, but I was also to able participate in seminars and working groups, exchanging views and gaining knowledge from other students as well as well as contributing. "The support available at LSBU was great. I will never forget the 1-2-1 meetings I had with my lecturers, especially the tailored support on offer, which made me feel at ease and reassured. I particularly appreciated moments when my lecturers used to tell me ‘you are on the right track’, that gave me the drive to push myself to produce the best results. "Another form of support I received was through the Student Learning Centre and the library, nothing was too much to ask the staff. I received help with everything - from printing and IT issues, to finding books, to learning how to request loans from other libraries to support me through this course. "While at LSBU, I built a professional network and professional relationships with students from different backgrounds living in the UK and abroad. We have been able to stay in touch through social media, keeping each other updated with our professional lives after completing the course”.